Take, for example, the wedding ring that Princess Mary, the daughter of England's King Henry VIII, was given when she married the son of King Francis I of France in October 1518. In keeping with the tradition of the time, this wedding ring was very likely a simple golden band. Mary's was also probably the smallest of all wedding rings ever made; historians among you may remember that Princess (later Queen) Mary was born in 1516. You do the math. Her erstwhile Consort was born February 28, 1518; talk about robbing the cradle. For some reason, wedding rings just don't get the press that engagement rings do; nor does their history extend back nearly as far. Although the Bible doesn't directly mention wedding rings, among some monkish orders it's considered common knowledge that Mary, mother of Jesus, wore an onyx or amethyst wedding ring given to her by Joseph. Otherwise, wedding rings have been traditional in most of the Western world (particularly in Judeo-Christian tradition) for over a thousand years, though ironically have not been as popular as engagement rings. This changed in the 1100s, when Pope Innocent III decreed that wedding rings were required for all wedding ceremonies performed in the Catholic Church. This practice continued as law after the Reformation in England, which explains the necessity for Princess Mary's tiny wedding ring. However, since there was no law as to what type of material could be used, wedding rings used in Church of England ceremonies took many forms. In the 1700s, the Duke of Hamilton even used a bed-curtain ring. In modern times, of course, wedding rings are much more ornate. Camilla Parker-Bowles and Prince Charles of England, who were married in a civil ceremony in April 2005, wore classy 22-karat gold wedding rings specially made for the occasion. 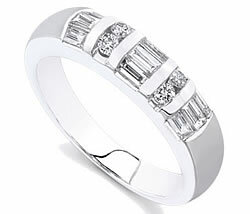 Their rings, however, were the epitome of quiet taste compared to the wedding rings worn by some modern celebrities. In the 1960s another soon-to-be King, Elvis Presley, gave his wife Priscilla a wedding ring crowned with a 3.5-carat blue-white scorcher surrounded by 21 smaller diamonds. More recently, actor Dennis Quaid gave his bride, Kimberly Buffington, a platinum wedding ring with a three-carat canary yellow diamond surrounded by white diamonds. Britney Spears' double-banded engagement/wedding ring, which she chose without the help of husband Kevin Federline, started a trend among ring shoppers. The wedding rings sported by singer Jessica Simpson and her former husband, Nick Lachey, were eye-poppers. Her white-gold ring sported three diamonds almost big enough to eat off of: a huge central diamond flanked by two slightly smaller ones, totaling 3.5 carats. Now that's a ring that's forever, even if the marriage wasn't.